C & K Atelier - Fetish-Couture in highest Quality - Handmade in Germany - - Spikey jacket "Moscow"
This elaborately decorated jacket is worked with many spikes and rivets! Sleeves, rever and collar are decorated with many metal rivets and spikes, all stamped in by hand. The closure of this very noble jacket is with a metal-zipper with crown slider. Also available with many other sliders, please have a look here. Also a lot of stitching seams decorate this exclusive jacket. 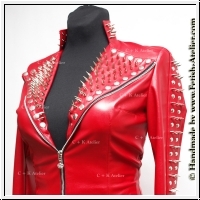 This very elaborately worked jacket is a MUST-HAVE for every spike lover. With this exclusive jacket are you THE eyecather! As all our other items, we tailor this jacket extra for you, so each design changes are very welcome. Also possible to work into plastic zippers instead of the metall zips. Feel free to contact us for any questions or design changes. The jacket "Moscow" is combined with the pants "Istra" and the belt "Double Eyelet".